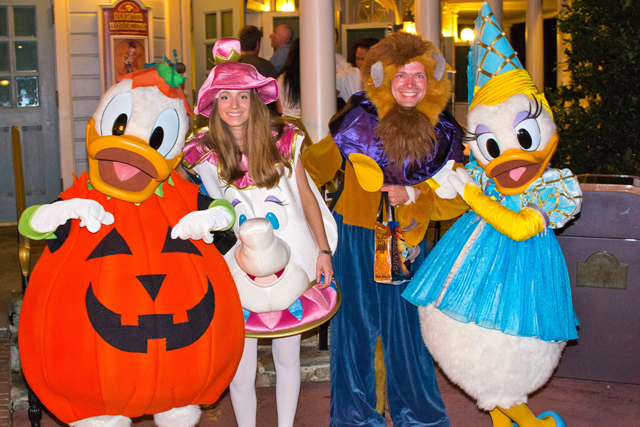 Ever left Mickey’s Not So Scary Halloween Party with some ghoulishly bad photos? Blame ghosts. Or evil-doers. Or something of that sort. Whatever you do, don’t blame yourself! (But who would do that?! It’s not the American way!) If you’ve had trouble taking photos during Mickey’s Not So Scary Halloween Party, not only are you not alone, and chances are, it’s really not your fault. Between the harsh artificial lighting and nighttime darkness during the event, Mickey’s Not So Scary Halloween Party presents the most challenging circumstances for outdoor landscape-style photography at Walt Disney World. That lighting really adds to the great ambiance during the Party, but it wrecks havoc on our camera sensors. Well, there’s good news and bad news. The good news is that you don’t have to be an advanced-level photographer in order to improve the photos you take during the party. The bad news is that, unlike many other times when taking photos at Walt Disney World, you will hit some walls based upon your camera gear. Normally, skill and knowledge matter far, far more than the equipment you use (despite all of the “I wish I had a camera that takes photos as good as your camera” comments I receive), but in this case, the importance of equipment is actually high. This is mostly true for photos of the Boo to You parade. If you’re looking to upgrade both your knowledge and your gear, my recommendation for those who want to stick with point and shoot cameras would be to purchase either the Canon S100 (budget) or the Sony RX100 (more expensive, but a beast of a pocketable camera). I could go on and on about which DSLR you should purchase if you’re in the market there, but I will spare everyone the boring details. As a Nikon shooter, my recommended options include the Nikon D3200 (entry), Nikon D7000 (moderate), or Nikon D600 (advanced). For those who aren’t looking to spend any money, here are some tips to improve your photos with the camera you already own. Since I presume most of you are using point and shoot cameras or perhaps entry level DSLRs, I’m going to keep the tips simple and approachable. For advanced tips on photographing the Halloween Party, I’d recommend checking out Disney Photography Blog, which has some excellent Halloween material. The first tip is to arrive at the party as early as possible, and try to get as many photos then. If can enter the Magic Kingdom on Party nights with your event ticket as early as 4 pm, and you will see Cast Members in costume and decorations out that early. Get as many photos as you can right away if your goal is photos. In the daytime light, these photos are much more likely to turn out. 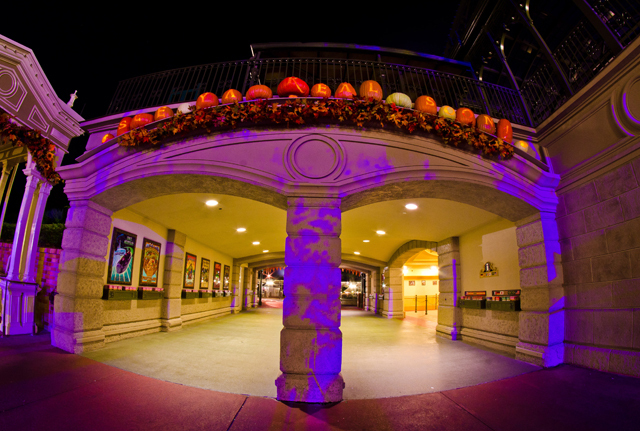 Grab photos of the snazy Cast Member costumes then, the “See Ya Real Soon” pumpkins lining the backside of the Train Station (most people don’t notice these or think to photograph them until they leave), the cool Halloween statues in the hub, the festive bunting, and the lamp-post decorations on Main Street all right when you arrive. These photos will be exponentially more difficult to capture once night falls. Plus, if you can capture all these photos before the of Party actually starts, you have more time during the Party to enjoy Party-specific entertainment! At or shortly before 7pm, many party attendees are going to turn their focus to character photos. If these matter to you, you should arrive early for some of the more popular characters (follow our excellent Mickey’s Not So Scary Halloween Party Touring Plan). All night photos you take during the Party are going to be tough, character photos included. If you’re using a point and shoot camera and are at all comfortable with manual settings, try raising the ISO, using as low of an aperture value as possible (likely f/2.0 to f/4 depending upon your camera), and lowering the shutter speed. If people will be in your photos, try not to go slower than 1/30th of a second if you’re holding the camera or 1/60th of a second if you’re handing the camera off to PhotoPass and don’t go quite so low with the aperture (keep it around f/5.6). Also, don’t be afraid to ask the PhotoPass photographer to snap a couple photos with your camera, which gives you a higher chance of at least one being in focus/good. If you’re not comfortable with manual settings, see if you can find a “night portrait” or “dusk portrait” mode on your camera. The camera will, more or less, choose the same settings in these modes. With these settings, you’ll get some ambient background light into the shot to bring some detail to the background so it’s not just your party and the character set against a black background. If you commonly have this problem, it’s because your flash is the main source of light in your photos–you need to adjust your settings. If you get a blurry photo when using this preset mode, it’s because of camera shake. Try to hold the camera as stable as possible or set it on a trash can or other surface to minimize this issue. Next up is the Boo to You parade, which is really difficult for photography. Your equipment simply may not be able to capture good parade photos. There’s really no good “auto” mode that you can select for the parade on most cameras (Try “kids and pets” mode with flash turned on). Because the floats move, you need a relatively fast shutter speed. Due to the fast shutter speed, you need a really wide open aperture and high ISO. While I typically hate the look of flash on parade floats, your equipment, especially if you’re using a point & shoot, may require that you use the flash. Honestly, if you don’t have the camera to take good parade photos, I’d just recommend setting it down and finding good photos online, and just enjoying the parade in person. Boo to You parade photos with the flash as the only light in the frame aren’t going to look that good, anyway. Fireworks are also going to be difficult unless you have a tripod or really, really steady hands. In manual modes, I would advise to set the camera to 400-800 ISO for a point & shoot, aperture as low as you can go (f/2.0-f/4), and shutter speed of 1/15th of a second or so, depending on the steadiness of your hands. Most cameras have a fireworks “auto” mode, but the assumption on the camera’s part is that you have a tripod or some way of stabilizing the camera if you’re using this mode. If you try to use it handheld, you’ll end up with a lot of blurry shots. I’ve had good success stabilizing the camera on someone else’s head before (seriously). Just make sure they stand very still and, of course, don’t use this method on a stranger! Another great aspect of Mickey’s Not So Scary Halloween Party is the excellent ambiance and lighting just about everywhere in the park. You know what else is just about everywhere in the park? Trash cans. Trash cans provide the perfect stabilization device if you don’t have a tripod. Set your camera on one, set it to a “night” auto mode (or dial in manual settings for a long exposure), and capture some wonderful shots. 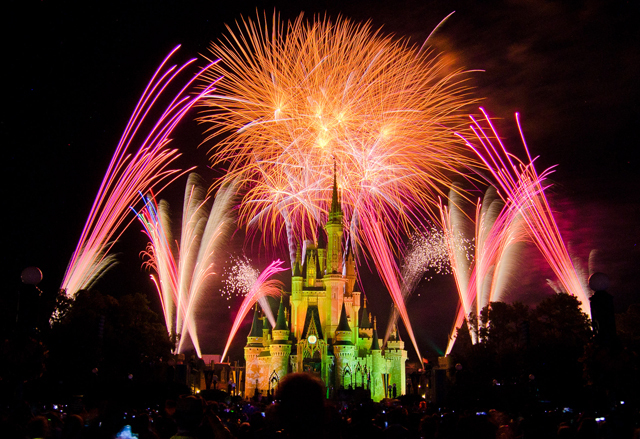 There are great places in Tomorrowland, Frontierland, and Adventureland for photos like this. However, the best place for these ambiance photos is Main Street. It looks incredibly spooky during the Halloween Party, and photos of it are a “Must Do” during the Halloween Party. If you want to get in the photos, use the trash can and set it to a night portrait mode, or otherwise enable the flash. On your way out of the park, make sure you grab as many photos as you can of Main Street! With these tips in mind, hopefully you’re able to capture better photos at Mickey’s Not So Scary Halloween Party! 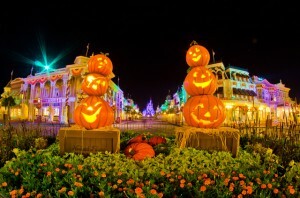 Do you have any tips for photography at the Mickey’s Not So Scary Halloween Party? Any specific questions I might be able to answer? Share them in the comments! ← What’s in My Disney World Hotel Room? When using a trash can (or other Disney World infrastructure) as your night shot stabilizer, I recommend setting your camera’s shutter to timer mode so that the actions of pressing and releasing the shutter button don’t cause blur from the slight camera movement. Thanks for this article! I had trouble taking pics last year a MVMCP hopefully my new camera and these tips will help me be more successful! This party presents so many unique photographic opportunities. I’m amazed how many new things I notice when I go, and at how many details I see in other photos like yours or at DPB that I overlooked. I planned for all kinds of shots I missed last year when I attended this year, but found so many new (to me) shots that I was almost overwhelmed. It is a lot of fun and a challenge! We love the party and go every year. 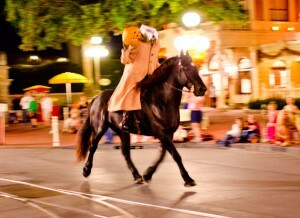 I got the best photo I’ve ever taken on the headless horseman by panning as he went by. I’m very pleased with that one! Fireworks on the other hand get me every single time. Of all the years we’ve been going I probably have 2 or three good shots. And those aren’t even very good, LOL! I can’t wait to go this year and try some of your tips! These are great suggestions! Thank you so much!! What great tips. Thank you!! 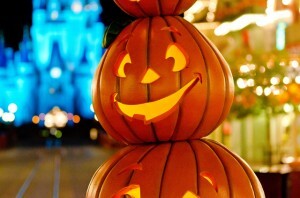 I’ve never had too much desire to attend MNSSHP until I read your article! Great Tips, what are the chances of seeing something similar for the Mickey’s Very Merry Christmas Party? This might sound like it is contrary to the advice on taking your own good photos, but does anyone know if the stock photos they have on the photo pass CD include anything from MNSSHP? If I can get some included in that, I can worry less about trying to capture my own and concentrate on the other stuff. It does. Both Christmas and Halloween photos are on mine. These are very good tips to remember to improve my photography skills. I’m currently looking for getting tips for photography because I need it in my class. I’ve enjoyed reading many of your articles about WDW. We will be going Oct. 6 and attending MSSHP. For the parade you mention you need the equipment to photograph it well. I have a Nikon D90 with a 50mm f/1.4 lens. What are your setting recommendations? Thanks.